Art Theme - "I, Robot"
Burning Man is a huge art festival dedicated to community, self-expression, and self-reliance. 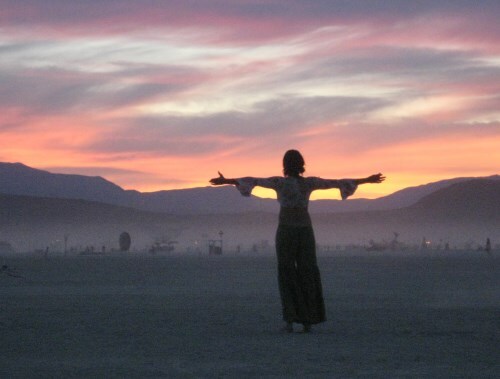 The annual event is held on the open playa of the Black Rock Desert, 100 miles north of Reno. Every year, this remote and virtually uninhabited place is transformed into Black Rock City, one of Nevada's largest towns for a week. From a small gathering to burn the first Man on a San Francisco beach in 1986, Burning Man now attracts some 72,000 attendees from around the world. Burning Man 2018 takes place from Sunday, August 26 through Monday, September 3. The art theme for Burning Man 2018 is "I, Robot." Even though I have attended Burning Man several times, I find that it's not possible to adequately describe the experience and what goes on. Burning Man is one of those things you need to see and participate in for yourself in order to understand the experience. Your experience will be unique and different from that of everyone else. If you are a virgin (someone who has never attended Burning Man), the best place to start is at the source. Here are some Burning Man website links to get you started. Once you get going, these will lead to a whole lot more. Burners and wannabes who can't be in Black Rock City can still get a look at the event via online live streaming. The feed comes to us from YouTube and is available as Burning Man Live Stream. There is obviously nothing to see until the event starts, so click the link to see what's on the air during the dates when Burning Man is happening. There are numerous art installations around Reno that first appeared at Burning Man. 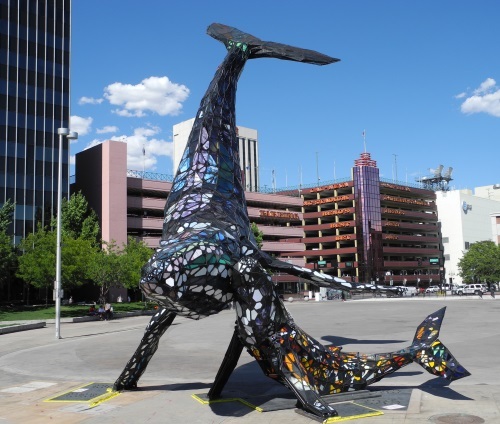 Two of the most prominent are the "BELIEVE" and "Space Whale" sculptures in City Plaza, across from City Hall and next to the Virginia Street Bridge. Others include "Portal of Evolution" at Bicentennial Park and "Pentamonium" at the Lear Theater. The "Reno Playa Art Park," features more Burning Man art. This park is a great use of vacant land created by the demolition of two derelict motels. It is located in the 500 block of N. Virginia Street, across from Circus Circus.